When you think of knee replacement surgery, you generally envision an older adult with painful arthritis. But the procedure is also used for younger patients with juvenile idiopathic arthritis (JIA) whose joints have been severely damaged by the disease. Because the surgery in younger patients is relatively rare, little data exist on the longevity of knee replacements in JIA patients. "The surgery in this patient population, although performed by only a small number of highly specialized orthopedic surgeons nationwide, is life-changing for JIA patients," said Dr. Mark P. Figgie, senior author of the study and chief of the Surgical Arthritis Service at HSS. "Joint replacement can free patients - many of them adolescents - from a life of unrelenting pain. It can enable those in a wheel chair to walk again, giving many a new lease on life." The study, titled, "Total Knee Arthroplasty in Patients with Juvenile Idiopathic Arthritis: A Multi-Center Study," was presented at the annual meeting of the American Academy of Orthopaedic Surgeons in Chicago. "Juvenile arthritis is a debilitating condition that can really affect the patient's ability to function, yet few reports exist on the results of total knee replacement in people with JIA," said Dr. Figgie, who is the Allan E. Inglis M.D. Chair in Surgical Arthritis at Hospital for Special Surgery. "Because of the low volume of procedures in this patient population, we used an international, multi-center approach to determine the survivorship and functional outcome of TKR in this group of patients." Although the study found that overall, the longevity of total knee replacements in younger JIA patients is slightly lower than in older patients with osteoarthritis, the procedure gives many juvenile arthritis patients their life back, according to Dr. Figgie. "It not only alleviates their terrible pain. 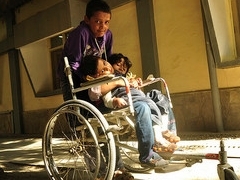 Many patients were able to walk again, go back to school and lead normal lives." Dr. Figgie and colleagues compiled results from JIA patients who had total knee replacements by experienced orthopedic surgeons at five hospitals between 1979 and 2011. Those participating in the study included Hospital for Special Surgery, Brigham and Women's Hospital, Stanford Medical Center, the University of California San Francisco Medical Center and Catholic University Hospitals in Belgium. A total of 217 patients with 335 knee replacements were identified by chart review and then contacted to survey their outcomes. Data on revision surgery, walking tolerance, ability to go up and down stairs, and the use of walking aids were included in the survey. While the implants lasted at least 10 years in 92 percent of JIA patients, the data show that total knee replacements last slightly longer in elderly patients with osteoarthritis," said Dr. Figgie. "This is not really surprising, as the longevity of the implant may be affected by the JIA patient's poor bone quality, severe joint deformities and contractures, and the immunosuppressive medications used to treat their disease." "One of the reasons I launched the study is to make sure we have continued access to custom implants if they are needed for a younger patient," said Dr. Figgie. "The better the implant fits, the better it should function, and the longer it should last. When you're operating on a 12-year-old and using something they will have in their knee for the rest of their life, you want it to be as perfect as possible."